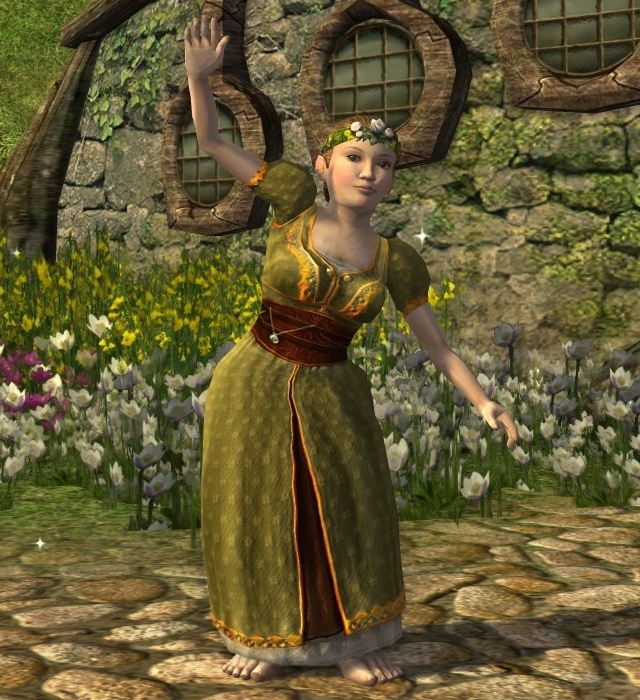 Welcome to The Starry Mantle, a blog where I share my LOTRO outfit creations. I’m a long-time LOTRO player who’s always enjoyed LOTRO’s cosmetic outfit system, especially as a tool to create a visual context that really makes a character feel at home in Turbine’s interpretation of Middle-earth. Beyond creating lore-appropriate or -inspired looks, LOTRO’s large amount of cosmetic skins range from beautiful to quirky to weird to funny to epic-looking and everything in between, and sometimes I dabble in these kinds of looks as well. I’ve been hugely inspired in this pastime by the exceptionally talented LOTRO outfitters listed in the blogroll to the right: Cosmetic LOTRO, the LOTRO Stylist, and LOTRO Fashion are the original outfit bloggers that started it all and really got me interested in using the wardrobe system to its fullest potential. I am always astonished by the creative and fascinating combinations featured on all of these blogs and in the popular “Show us your favourite cosmetic outfit” thread on the official LOTRO forums. It is clear that a great many LOTRO players, including those who do not keep blogs, have a passion and a talent for outfitting. The possibilities of great combinations for LOTRO outfits are endless. I think it is really interesting how each of the esteemed outfitters on my blogroll has their own unique voice and creative vision, bringing their own unique perspective to their creations. I hope that I too will be able to lend a little inspiration to anyone who stops by. I love seeing recreations of the outfits posted here on the blog, so feel free to email them to me or even better tweet them @TheStarryMantle on Twitter. …[T]he lady Éowyn wore a great blue mantle of the colour of deep summer night, and it was set with silver stars about hem and throat. Faramir had sent for this robe and had wrapped it about her; and he thought she looked fair and queenly indeed as she stood there at his side. Thank you for visiting The Starry Mantle! I look forward to sharing many more outfits before the Ring goes into the Fire. Thankyou so much for starting your blog. I do have been playing for 5 years and love the cosmetic system. You can never have too many inspiring blogs and yours is one of my favourites. Happy 6 months and here’s to many more. Your work is amazing and fabulous! I love your creations with the LOTR characters I really hope to see more because the are perfect! Thanks so much Jerome! I appreciate the kind comment. 🙂 I’ve been feeling a little uninspired lately and I don’t want to post any outfits I’m not happy with. That said, I do hope the inspiration returns so I can post some more outfits!